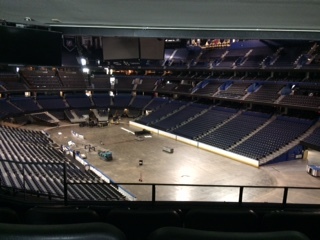 Did you know Amalie Arena uses vegetables straight from their own garden? 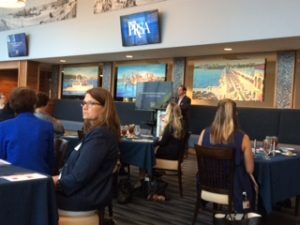 That’s one of the many things HCP learned today at PRSA Tampa Bay Chapter’s inside look at the Lightning franchise. On our tour, we saw the Lexus Lounge, the Chase Club and the press box. During hockey season, the arena is electric, but the staff manage to stay busy year-round. The rink transforms into an indoor football arena for the Tampa Bay Storm. It also converts into a stage for concerts. It only takes 12 hours to change to each event. Jim Shi mberg, EVP of Tampa Bay Sports and Entertainment, explained how the Lighting became America’s best sports franchise. Jeff Vinik took ownership of the Lightning in 2010. The hype from winning the Stanley Cup in 2004 was over. Season tickets were less than 5,000. And the Lightning ranked No. 85 in ESPN’s annual ultimate standings. ESPN ranks all 122 NHL, MLB and NBA franchise in categories that matter most to fans. As the Lightning picked up momentum, the organization developed into a world-class franchise. The team kept moving up on ESPN’s list. Finally, in 2016, they made it to No. 1. Shimberg also shared what’s in store for downtown Tampa. He says Vinik wants to make downtown more walkable. Under his vision, downtown will take on a neighborhood vibe with more open space and parks. Two hotels are condos are in the works. And retail shops will be scattered throughout the area. By 2020, it may look completely different and we can’t wait to see it.